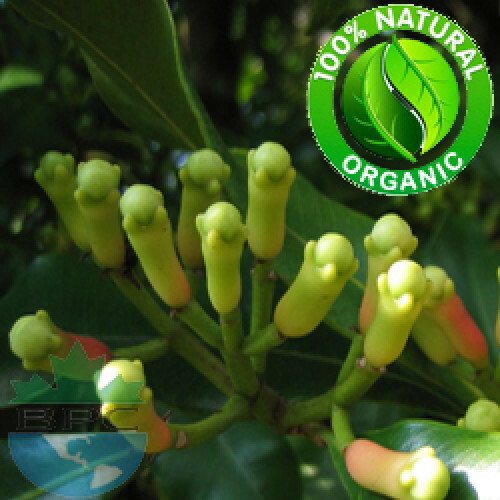 Description: Clove Bud Essential Oil is derived from the Syzgium aromaticum tree. It is a slender evergreen that grows up to 12 meters in height (approximately 36 feet). At the start of the rainy season, long buds appear. They change color over time and are beaten from the trees and dried. These are the cloves sold commercially. Aromatic Scent: Clove Bud Essential Oil smells spicy like actual cloves. The aroma of this oil is a bit sweeter than the Indonesian variety and slightly less herbaceous. For this reason, we recommend that you order a sample before making a larger order. Common Uses: Cloves are used in Indian Ayurvedic medicine, Chinese medicine, and western herbalism and dentistry where the essential oil is used as an anodyne (painkiller) for dental emergencies. Clove Bud oil, applied to a cavity in a decayed tooth, helps to relieve toothache.The clove essential oil is used in aromatherapy when stimulation and warming are needed. Topical application over the stomach or abdomen are said to warm the digestive tract, to relieve digestive problems.Clove Bud oil is also used in balms to help improve circulation to soothe muscle aches and pains. Clove oil is the active ingredient that helps the blood flow through the area and helps to reduce the pain. Because it helps improve circulation, Clove Bud oil is ideal for reducing the pain and discomfort typically associated with tension headaches.When used for aromatherapy purposes, Clove Bud oil helps to stimulate the brain. The strong aroma of Clove Bud oil helps one to become more attentive and can even help one feel more energetic than they normally are.